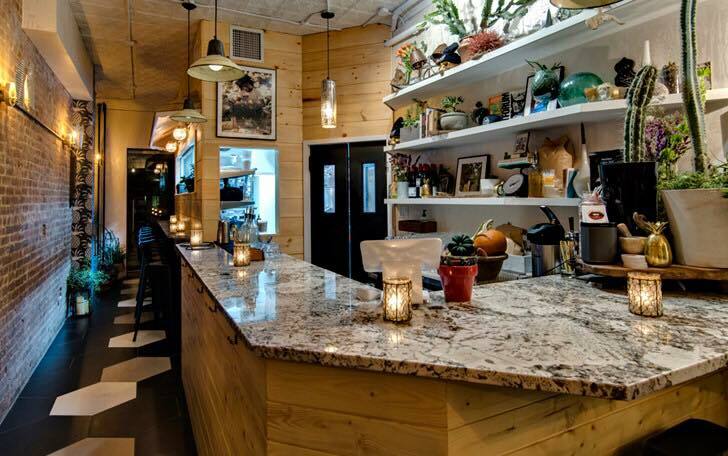 Aimée Wilder's designs are spicing up the walls of Brooklyn's chic new comfort-food-goes-heathy(ish) spot, Pretty Southern. Opened by the highly-acclaimed Chef Sam Talbot, the restaurant features Aimée's Cactus Spirit pattern in the color Spirit Mist on one side of the restaurant’s main dining space, creating a subtle, yet striking complement to the exposed brick of the opposite wall and rustic wood panels of the bar. Piña Sola, in a charcoal grey shade (Thunder), greets guests as they pass into the restaurant's charming garden, and also creates a festive vibe in the restroom. This graphic pineapple design is the perfect way to make visitors feel welcome--the pineapple is a well known symbol of hospitality, after all!